PUNCH was founded in 1970's by Mr. James Abdomerin and Sam Amaku. As at then it was known to be a media house with integrity. A media house that upheld the truth and was widely read newspaper as a result. But, it is unfortunate that such is not the case, rather than represent light and truth to the people, it is now an agent of darkness and lies. I wonder what came over them that made them disregard their long-built integrity for monetary reward. I wonder how much the Nigerian government deposited into their account that made them leave the road and enter bush. There is an Igbo adage that says "ezi afa ka ego" which literally means in English that "good name is better than money". I am not here to teach the punch newspaper moral lesson but to tell the world how gullible the punch newspaper has become. 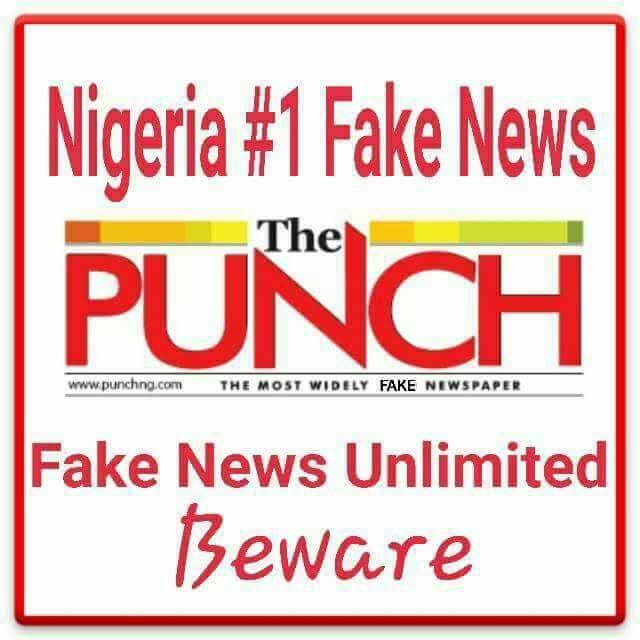 Information at our disposal with facts has it that the IMO state governor, Rochas Okorocha (the Hausa Fulani puppet in IMO state) in conjunction with other agents of the zoo has paid punch newspaper huge amount of money to circulate fake news against Nnamdi Kanu and Biafra restoration. Yesterday punch dated, Saturday 28th July 2017 has it that "Youths oppose Kanu, disrupt rally". It went on to read, 'group of south Eastern Nigeria warned Nnamdi Kanu never to hold rally in IMO state and that the coordinator of one Nigeria said', "we are for one Nigeria" said Mr. Azunnaya Andrew. It continued, "One Nigerian group stands for Nigerian's oneness"
It went on to say, "we totally condemn the pro-Biafra rally in Owerri conducted by one Nnamdi Kanu." Just imagine PUNCH flying from "youths disrupting a rally" to "youths condemning an already held rally". What a poor content writing cheap lies! The fake news continued that "the chairman, Board of Trustees of the IMO Council of Youths, Jeff Nwoha,: the coordinator of the Nigeria Youths unity group(faceless organization that does not exist), Emeka Igwe and the national spokesperson of the Youth Assembly of Nigeria, Samuel Godstime, said rather than go for Biafra, Youths in the South-East wanted restructuring. Also, the lies went on to say that ,Ohimili Arinze, who it said was speaking on behalf of ex-militants in the state, 'stated that they believed in the unity of Nigeria and would continue to support it, adding, "we don't want to hear anything like Biafra in IMO state, we are fully in support of Nigeria and we will not allow any self-serving group to come and disrupt the peace we are enjoying in the State"
What a fake news and lies. The news above was conjured/cooked by Chidiebube, Gibson Achonu to fulfill their own part of the bargain with Gov. Rochas Okoro-Hausa. The news was obviously concocted and the groups never exist. It is clear to everyone who followed the event on YouTube of Nnamdi Kanu's visit to IMO state to see how peaceful, organized the rally was and how massively Biafrans from IMO and other parts of Biafran land trooped out en masse to welcome Mazi Nnamdi Kanu. Even other media houses reported genuinely how Nnamdi Kanu grounded Owerri. Owe of Owerri as a traditional prime minister of Owerri was there live to welcome him. Also, Biafrans from Orlu, Mbano, Obowo, Mbaise, Ngor-Okpuala, Okigwe, Owerri and its environs stormed the rally bearing Biafran flags, shirts, caps, shoes and banners, singing freedom songs at the sight of our leader Nnamdi Kanu which shook the people even in the government house. In a nut shell, no idiot sent by Hausa Fulani crook like the fake mentioned organization could have had the courage to disrupt such gathering. 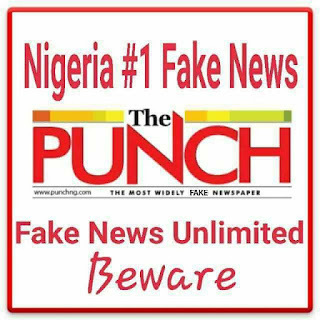 Therefore, hence punch has danced where the angels fear to set their foot on by selling such a fake news to the public. We will show them that the era of monopoly in news writing and publication is over. For ever painting IPOB black we will reduce them to nothing. 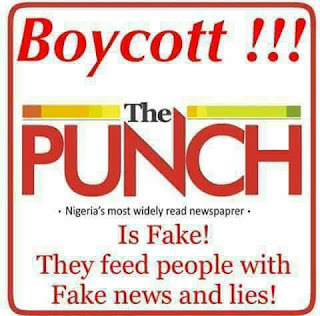 From today we urge every Biafran and lovers of freedom to avoid PUNCH newspaper both their online news and printed copies being sold anywhere on the surface of the earth. All Biafrans should never follow, like or tweet them on Facebook, Twitter or any platform. Let this war begin but they should ask vanguard how market because we don't back out in any war. They must pay for allowing a 419 like Okorocha who obviously didn't know what else to do to prove to his master that he is still a humble servant to use them. And any Biafran who patronizes punch newspaper is an enemy of Biafra that is how fanatic we are about Biafra.